Every month, we highlight one of our amazing staff members so you can get to know the Morgan Hunter Healthcare team a little better! This month, we spoke with Regional Manager Tamara Miller RN, BSN. 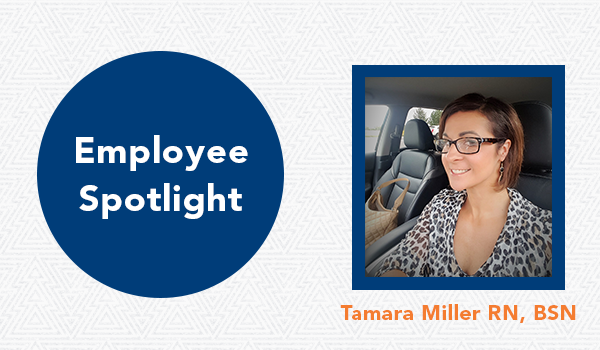 Find out more about Tamara in our Employee Spotlight! How long have you worked for Morgan Hunter Healthcare? I graduated nursing school with my BSN in 1997. I have 21 years of experience with over 10 years as a bedside nurse, specializing in ICU/CCU. During my time as a bedside nurse, I developed several medical device patents. During my pursuit of bringing the patents to market, I discovered a passion for sales. Since 2007, I have been working in the healthcare area, primarily in business development, workforce solutions, and vendor management. I joined the Morgan Hunter Healthcare team in the fall of 2015. The opportunity aligned perfectly with my healthcare experience and the understanding of how technology impacts everyone involved in providing and receiving care. Can you briefly explain what you do at Morgan Hunter Healthcare? I am a Regional Manager at Morgan Hunter Healthcare. I am responsible for covering the Great Lakes Region which includes Indiana, Illinois, Ohio, Wisconsin, Michigan, Kentucky and West Virginia. My main responsibility involves partnering with hospitals and health systems in the region to address the IT needs related to their EMR. Our company specializes in providing the right IT consultants for the projects. Our consultants have been instrumental in hospital implementations, optimizations, and go-live support. As a result of Morgan Hunter Healthcare being in the IT Healthcare space for more than 15 years, we understand every project is unique and are proud to employ the best IT talent across the nation. Cleveland Browns (I know they stink…it’s heartbreaking). Lady Bird or The Shape of Water. It is a toss-up. I enjoy being around people and participating in outdoor activities such as skiing and running. My family and friends are very active and we enjoy trying new things. I am an inventor and have two patents in healthcare products. I designed these products when I was a bedside nurse. It was quite the journey taking an idea and building it into an actual product. I had the privilege of meeting with some great people in engineering, sales, research and development, and procurement. It was an experience that I am very grateful for and has enriched my life in many ways. What do you think are the biggest challenges healthcare organizations will be facing in the coming years? I believe there is a lot of uncertainty about healthcare regulations and reimbursements. Where do you see the healthcare IT industry going in the next 5-10 years? As a nurse, I see the aging populations, emerging diseases, and inequitable access. The use of key medical IT technology and software is needed to significantly impact the future of patient care. I am hopeful that the advancements in IT health technology will improve access to healthcare as assessment and intervention will be possible to access remotely.